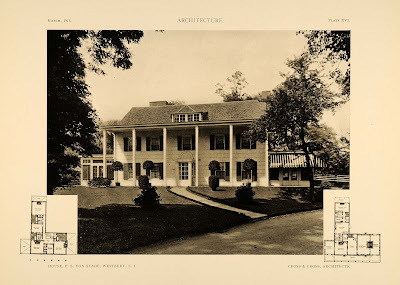 The Francis Skiddy Von Stade Sr. estate designed by Cross & Cross c. 1914 in Old Westbury. Skiddy was a member of F.S. Von Stade Co., importers of bristles, but was better known for his equine activities. A polo player in his youth, he was a member of the 1912 and 1913 Cooperstown team that won the Open Championship and played with the Meadowbrook team that won the Open Championship in 1919 and 1920. He was rated at six goals in 1922. Von Stade was a steward of the Jockey Club, was president of the Saratoga Association before NYRA took over the Saratoga track and was a founder and executive vice president of the National Museum of Racing in Saratoga Springs. He was also a charter member of the Grayson Foundation which was involved with equine disease research. He married Kathryn N. Steele, daughter of Charles Steele who owned the former Lanier estate next door. He was also mayor of Old Westbury from 1940 to 1950 and remained a trustee until his death in 1967. The estate was later owned by the Entenmann family and eventually became a dilapidated, abandoned wreck of a house. After sitting on the market for a number of years the property was finally purchased to be subdivided and the main house set to be razed. That work is currently underway. Click HERE to see the Von Stade estate on google earth and HERE on bing. Pictures of the house pre-demolition will be posted soon (as will the c. 1930 alterations by Peabody, Wilson & Brown). Photos from Architecture magazine, 1915. Typical Cross and Cross work of the period to my eye- attractive, perfectly serviceable and appropriate, but a tad bland. Given its eminently manageble size, it's surprising that it fell into disrepair. To your point Magnus...it was roughly tripled in size by Peabody, Wilson & Brown c. 1930...which I also have period pictures of and will post soon. Was trying to keep everything in order. Great family.Still very "horsey", some of whom have relocated, permamently, to Aiken, S.C.. I am so sad to see this one go , too. There's some Bostwick blood in there too, somehow. I agree with Magnus about the bland look. Still, I think the original floor plan is very good & could easily be adapted to serve a family today. But tripled in size? Ironic because I'm sure in 1930 the owners never thought, "This will eventually doom this house for sure." Is that circular structure behind the house the stables? We're often looking at houses with riding facilities attached. Here's a new one in Aiken, for just under $4 million, on what's described as "formerly the Bostwick Von Stade land." The taxes on this house are likely lower than the grocery bill of anyone living in ANY of the houses we look at here. Golly gosh! Talk about the little house that grew...and grew. It takes a lot of money to be able to afford to abandon a property like this. Dissenting voice here, once again. The circular building would actually be an indoor riding ring, no? Although there have been notable examples of circular stables, the stables here appear to be the complex of buildings to the east. It was indeed an indoor riding ring. There are stables to the above right of the ring and there are additional stalls in the U shaped barn building to the lower right of the ring. At some point between the Entenmann's ownership and now the house belonged to some sort of school. There were stacks of old books and papers and children's things scattered about some of the smaller outbuildings. ALL the outbuildings are now gone. That was in June, the main house is probably gone by now. Sad! Did anyone catch Mansions of the Gilded Age September 27? "Seaview Terrace" in Newport, Rhode Island owned by Martin Carey. His link goes to Seaviews' very own website. Full of praise for his Carey Mansion and efforts for restoration. 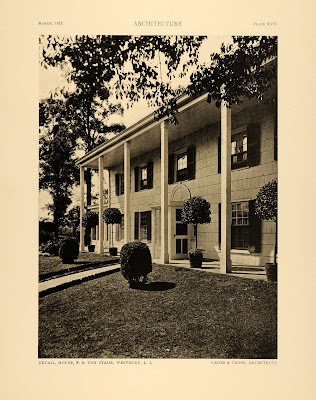 I couldn't resist sending this email - Will Mr. Carey ever devote his efforts and money to saving and restoring the classic Delano & Aldrich designed “Bogheid’ and the historic Woolworth estate “Winfield Hall” he owns in Glen Cove, NY??? Response - This email was reported for harassment and slander. Please be advised you have been blocked from any future communication. "How Nice" as in a Steel Magnolia sort of way. I encourage anyone to send a little message to WAKE HIM UP! The round building was not original was added in the mid 1980's after the Von Stades sold the property. My family were caretakers of the estate in the 60's and 70's. It is very sad to see it razed.